Game species are species which can be legally hunted. Many states have their own specific regulations. 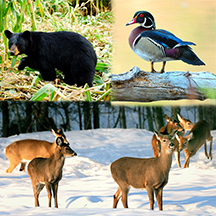 In Massachusetts, game species include the white-tailed deer, black bear, wild turkey, many waterfowl species, pheasant, and coyote 1.